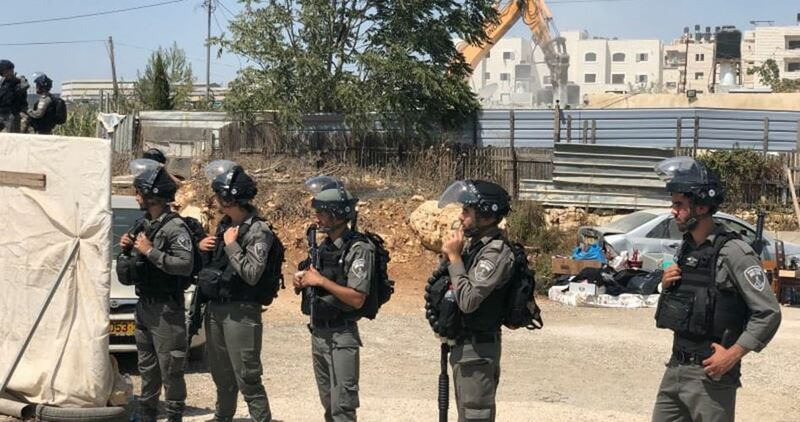 The Israeli occupation authorities on Sunday issued stop-work orders against three Palestinian houses under construction in al-Walaja village, north of Bethlehem. Activist Ibrahim Awadallah said that the Israeli forces during the early morning hours stormed al-Walaja and handed three Palestinian families notices ordering them to stop the construction work in their houses for allegedly being unlicensed. Awadallah told Quds Press that al-Walaja is targeted by an Israeli systematic plan aimed at pushing the village's residents to leave the area by depriving them of their right to expand their buildings and obtain building permits. In another context, the Israeli occupation forces on Sunday erected barbed wire along a bypass road in Tuqu' town under the pretext of protecting Israeli settlers against stone-throwing attacks. 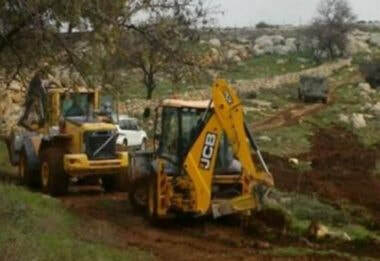 Furthermore, Israeli settlers, under the protection of the Israeli forces, bulldozed Palestinian lands in Khillat al-Nahla area in Bethlehem in preparation for the construction of a bypass road and new agricultural facilities for the settlers. 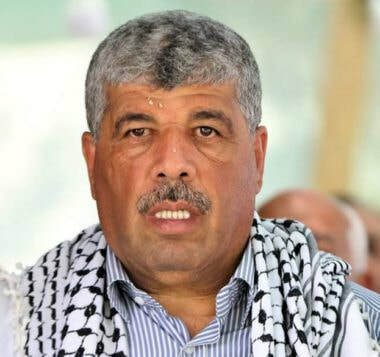 Palestinian government Minister and the head of the National Commission against the Wall and Colonies, Walid Assaf, has reported that the peaceful protests and gatherings in al-Khan al-Ahmar Bedouin community, east of occupied Jerusalem, will continue. His statements came after Israeli Prime Minister, Benjamin Netanyahu, said on Sunday morning, that the Bedouin community will be removed, and the Ministerial Security Cabinet, is the party that decides when the demolition will take place. On Saturday, Israel announced its decision to postpone, or freeze, the demolition of the Bedouin Palestinian village until further notice, to discuss all suggestions and alternate plans prior to carrying out the violent removal. Israel’s prime minister Benjamin Netanyahu assured his right-wing base that the delay in the demolition of the West Bank herding village of Khan al-Ahmar was temporary and that a timetable would be set by a Sunday cabinet meeting. "Khan al-Ahmar will be evacuated, this is a court decision, this is our policy and it will also be implemented,” the Jerusalem Post quoted Netanyahu as stating. “I do not intend to postpone this until further notice, contrary to the publications,” he added. Netanyahu spoke out after the Israeli government announced that the village’s destruction would be delayed until further notice. “The amount of time to achieve this consent will be determined by the Cabinet. I will convene it today. It will make a decision. The [timetable will be] short. I believe [the evacuation] will also be consensual,” he claimed. Netanyahu spoke just after Education Minister Naftali Bennett who heads the Bayit Yehudi party swore that he would ensure the demolition of the village. The international community, particularly the European Union and its member states, have called on Israel not to evacuate the village of some 190 Palestinian Bedouins. “It bears recalling, as a general matter, that extensive destruction of property without military necessity and population transfers in an occupied territory constitute war crimes under the Rome Statute,” she said. Israel’s High Court of Justice had ruled that there was no legal barrier to the demolition of the village, but that it preferred to see a negotiated resolution. 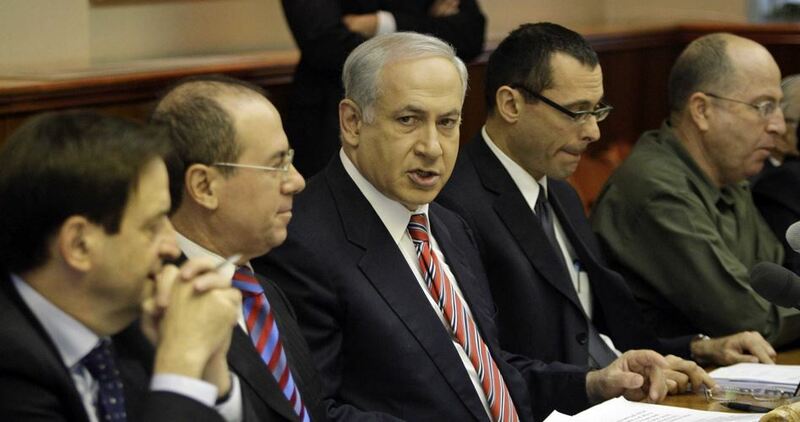 Right wing politicians and activists immediately condemned the delay and called on Netanyahu to rescind it. 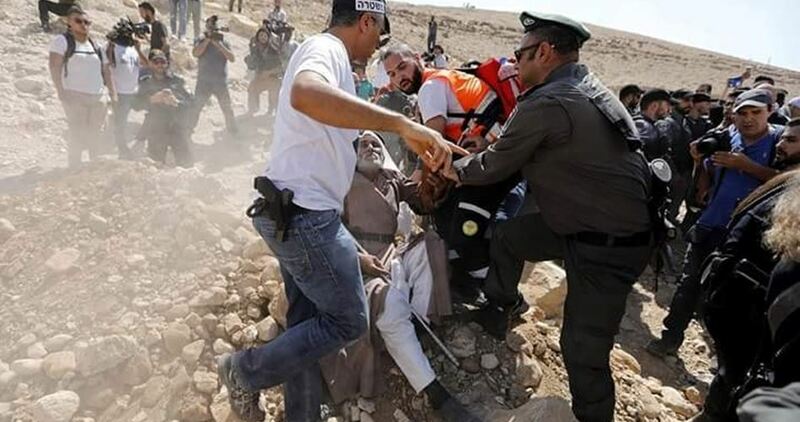 Repeated clashes have broken out in Khan al-Ahmar over recent weeks, as the Israeli occupation army cracked down on the locals and carried out road works so that it could more easily demolish the village’s residential tents and shacks. The Israeli government has decided to delay the forced evacuation of the Bedouin village of Khan al-Ahmar in Occupied Jerusalem until further notice, according to Israeli newspapers. According to sources in the Israeli premier’s office, there are Israeli intentions to negotiate with the residents of Khan al-Ahmar and to look at some of the proposals that have raised. The international community, particularly the European Union and its member states, have seemingly pressured Israel not to evacuate the Bedouin community that is located near Route 1, just below the illegal settlement of Kfar Adumim. 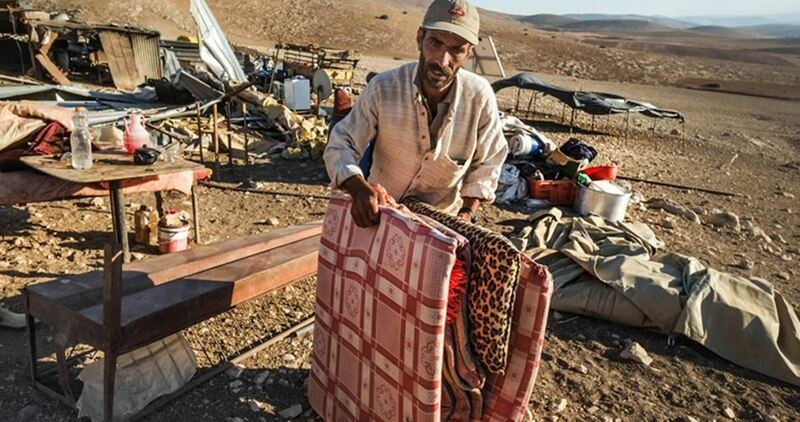 “I have been following with concern the planned eviction of the Bedouin community of Khan al-Ahmar, in the West Bank. Evacuation by force now appears imminent, and with it the prospects for further escalation and violence,” Bensouda stated. 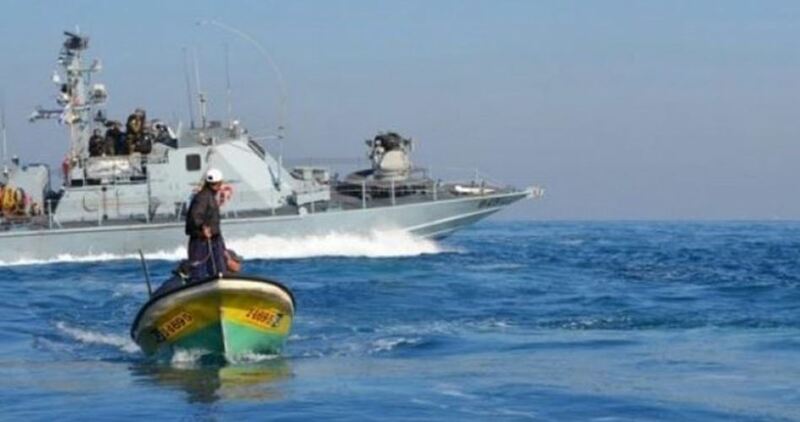 The Israeli navy on Saturday morning arrested two Palestinian fishermen off northern Gaza shore. Head of the Palestinian Fishermen Syndicate in Gaza Nizar Ayyash said in a press statement that the Israeli navy arrested two fishermen sailing off Beit Lahia and seized their boats. Ayyash said that Israeli gunboats attacked a Palestinian fishing boat in the early morning hours, arrested the two brothers on board Karim and Mohammed Abu Hassan, and confiscated their boat. He affirmed that the Abu Hassan brothers were fishing within the three-nautical-mile zone allowed by the Israeli authorities. According to al-Mezan Center for Human Rights, the Israeli naval forces have committed 232 violations against Gaza fishermen since the beginning of 2018, including 39 arrests. Dozens of Palestinian citizens performed Friday prayer at the sit-in tent set up in Khan al-Ahmar to protest the demolition order. The Israeli police in the early morning hours threw a cordon and installed several checkpoints around Khan al-Ahmar to prevent Palestinian citizens, activists, and press crews from reaching the Bedouin community. Palestinians have been protesting in Khan al-Ahmar for 122 days now against an Israeli plan to demolish the village and forcibly transfer its residents to another area that lacks basic services. Israeli occupation authorities, on Thursday, notified Palestinians in Al-Walajeh village, near occupied Bethlehem, about their intention to demolish a house and retaining walls in the village, according to local sources. 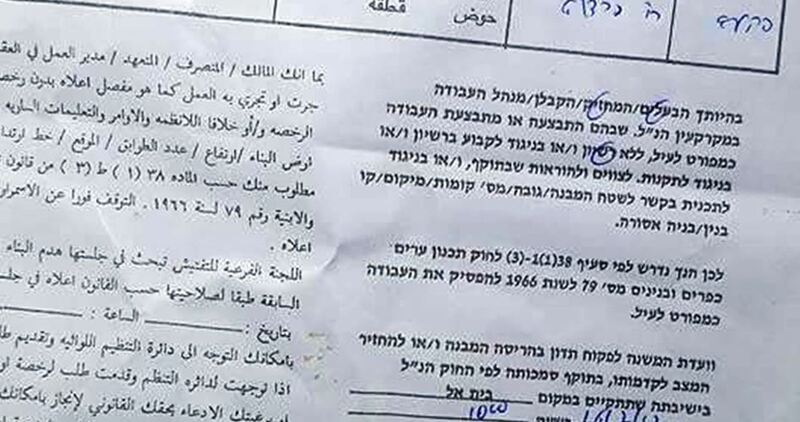 Ibrahim Awadallah, a local rights activist, told WAFA that the Israeli army, accompanied by staff from the Israeli municipality of Jerusalem, broke into the village and served notices regarding the imminent demolition of the house and the walls, which belong to local citizens. Israeli authorities claimed that the demolition would take place on the ground, that the house and the walls were built without Israeli construction permits. In recent years, Israeli occupation authorities have demolished hundreds of homes in the occupied West Bank and East Jerusalem, on the grounds of lacking an Israeli construction permit, which is almost impossible to obtain for Palestinians under current Israeli policies. Israeli bulldozers demolished on Thursday a number of Palestinian structures and agricultural facilities in the Bardala village in the northern Jordan Valley, to the north of occupied West Bank. Local activist Atef Daraghmeh told Quds Press that several Israeli bulldozers stormed the town and started demolishing a number of structures belong to a Palestinian identified as Khalid Sawafta. Daraghmeh called on international rights organizations to provide protection to Palestinians in the Jordan Valley in light of the Israeli systematic demolition and displacement policy. Meanwhile, the estimated 650,000 Jewish Israeli settlers in West Bank are more easily given building permits and allowed to expand their homes and properties, despite living in settlements that violate international law. Israeli bulldozers demolished seven structures and animal barns in the village of Bardala, in the northern Jordan Valley, on Thursday. WAFA reported that the seven demolished structures belong to a Palestinian identified as Khalid Sawafta. The demolished structures include three animal barns, a residential structure and three tents. According to Ma’an News Agency, the Jordan Valley and Dead Sea area holds nearly one-third of the occupied West Bank’s land and is home to roughly 60,000 Palestinians. Meanwhile, in Yaabad in the Jenin district in the northern West Bank, Israeli forces seized a mobile home resided by a Palestinian woman identified as Hishmeh Hamdouneh, according to Yaabad’s Mayor, Samer Abu Bakr. No reason was given for why the home was seized. Ha’aretz Israeli newspaper, on Thursday, reported that about 30 graves were vandalized two weeks ago, in the cemetery of Beit Jmal monastery, near Jerusalem. The monastery monks discovered the destruction of the tombs yesterday, saying the concrete crosses on the graves were taken down. The old cemetery is located about half a kilometer from the monastery building, so people do not visit it often. After the monks discovered the vandalism, monastery officials filed a complaint with Israeli police. In an interview with Haaretz, Father Antonio Scududo estimated that this work took time, effort and even the use of tools, because all the crosses were cast concrete. “I do not know who did it, as it seems,” he said. monastery, desecration of the sanctity of graves and religious symbols inside the cemetery, and breaking the tombstones and the number of 27 crucifix concrete. Secretary-General of the Commission, Dr. Hanna Issa, the occupation authorities responsible for providing protection for religious places and places of worship, calling for the need to stop the aggression on sanctities and places of worship and respect for all religions. PNN notes that the monastery was subjected to previous years of numerous attacks by settlers and attempts to burn and a line of racist slogans in Hebrew on the walls. Where the monastery was subjected to a similar attack on September 27, 1981, and the monastery was desecrated in March 2014 when anti-Christian slogans were written on its walls and another attack on 9/1/2016, breaking dozens of crosses in the cemetery. The Israeli occupation forces at daybreak Thursday knocked down Palestinian structures in the West Bank, leaving a number of civilians homeless. Israeli bulldozers rolled into Khirbet al-Marajem, in Duma, south of Nablus, and demolished a Palestinian room covering 60 square meters. 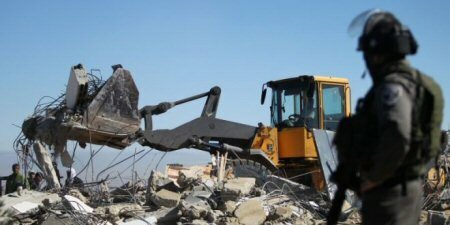 Head of the Duma village council, Abdul Salam Dawabsheh, said the demolition was carried out under the pretext that the facility is located in the Israeli-occupied Area C.
At the same time, the occupation forces demolished a Palestinian home in al-Hashimiya neighborhood, east of al-Bireh, in the central occupied West Bank. Local sources Israeli patrols broke into the area and reduced a home belonging to the Matriya family to rubble. The occupation forces also seize vehicles and closed off the area, denying journalists access into the demolition site. 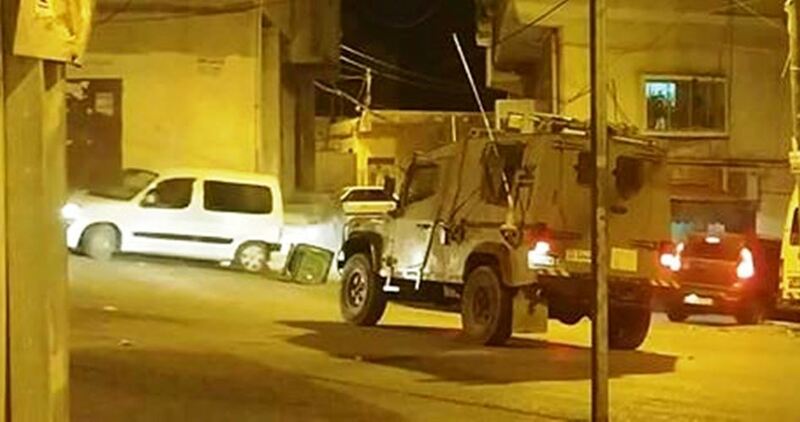 The Israeli occupation forces (IOF) on Wednesday evening confiscated at least 10 Palestinian vehicles during a campaign in Beit Ur al‑Tahta village, southwest of Ramallah in the West Bank. According to a local source, Israeli border troops sets up makeshift checkpoints at the entrance to the village and inside it, and embarked on intercepting cars. More than 10 cars were seized during this IOF campaign, while many drivers at the main entrance to the village received financial penalties.